Today my sister used a wheelchair for the first time. (We share the same inherited mitochondrial condition.) Her husband has little experience of pushing a wheelchair so I tried to give him some tips, which resulted in what I have written below. Believe it or not there is actually some skill involved in pushing a wheelchair and keeping the person in it comfortable. These are just observations from my own experience of being in a wheelchair pushed by someone else, but everyone is different. If you’re pushing a wheelchair for someone new then you should ask them if they have any preferences. Communicate. Ask if there’s anything you need to know first. NEVER touch or move a wheelchair without permission. Don’t overshoot checkouts and reception desks. If you are level, your passenger has gone too far past it. Don’t bump your passenger’s feet into people, objects or walls. Particularly in lifts. Don’t follow anyone too closely. (See previous point.) Your passenger is closer to them than you are, and seeing backsides that close gets tedious. Watch out for oddly sloping pavements, especially near dropped kerbs. The wheelchair WILL veer sideways into traffic if you are not careful. Look ahead for bumps. Dropped kerbs are often not dropped very much. Be prepared to walk a long way around via the road. Always approach bumps straight on. If you are not straight, stop and turn first. 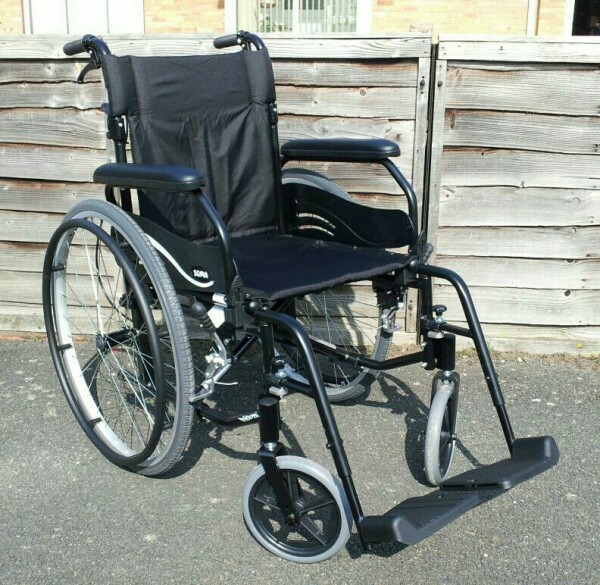 It can be easier to go backwards over bumps if the wheelchair has large wheels. Pay attention to the surface you travel over and take the smoother path. Cobbles can be painful or tiring for someone in a wheelchair. Don’t let the wheelchair run out of control. Consider taking slopes backwards so you can hold back the wheelchair. CHECK FIRST! Try going through heavy doors backwards so you can push the door with your body. Some wheelchairs have brakes operated by the passenger. Never assume that those brakes are on or off, always check. If someone speaks to you when they should speak to your passenger, tell them so. Be forgiving of your passenger. They have no control and that may make them grumpy. Wheelchair users: be aware that you might be shouting at your assistant more than you realise. If you’re pushing a wheelchair very far then you’ll probably want to get some gloves. Thanks to @knitswift, @chmasu, @missnfranchised, @lisybabe. You may recall last summer I made a video highlighting the difficulty that I had in getting between the village where I live and the local town in the electric wheelchair that I had been given by a relative. Following that video I was informed that a new wheelchair-accessible bus service would be starting up between the two places. Fantastic timing. However, since then, I have been quite seriously ill and unable to even go out in my wheelchair and I have been fortunate enough to have my father help drive me to medical appointments. Today I decided to take the new bus in to town for the first time since it started. The new bus route 552 out of Evesham and it’s accompanying bus 553 which goes around the loop the other way are advertised as running low-floor wheelchair accessible buses on the timetables and when my wife spoke to Henshaws, the bus company the runs the service, she was assured of that fact. Unfortunately this is what happened when I tried to board the bus today. As you can see, it is in fact rather inaccessible for a person in a wheelchair. The bus driver was very apologetic and tried to be helpful. She explained that the usual bus for that route was undergoing maintenance and that it had been substituted with an older bus for the day. She told us that the 553 which goes the other way around the loop was the usual accessible bus but would take a long time to arrive, and suggested that we could also try another bus that passes through the village, the 247 run by First Group. We decided to try the 247 but the bus stop for that service is actually at the top of the hill more than half a mile away. The 247 also does not use accessible buses all the time and so it was only a chance that I would be able to get on it. Fortunately that bus was wheelchair-accessible. The bus driver helpfully told us that only his bus was accessible today and told us when we could get his bus back from the bus station. 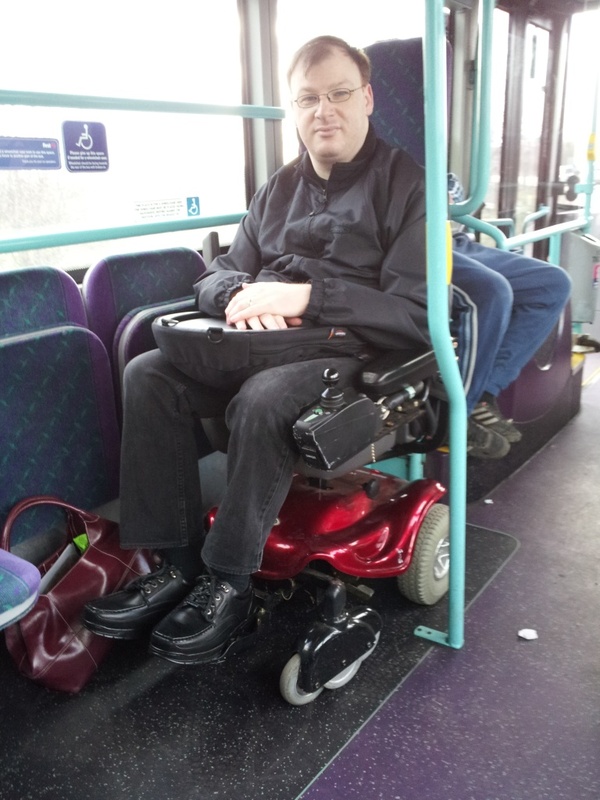 Here’s me on a wheelchair accessible bus for the first time. So what should I take from all this? Well obviously things are improving. The introduction of a (normally) accessible bus service proves that people are making an effort, and hopefully by the target of 2015 all bus services will be accessible all of the time. However, at the moment travelling in a wheelchair is thoroughly unpredictable. 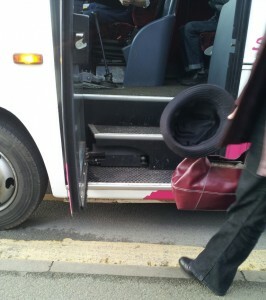 If a bus needs maintenance, no one thinks anything of swapping in a bus that wheelchair users can’t get on. If there is someone in a wheelchair already on board the bus, then tough, there is no room for another one. Other people have told me about problems with getting people to move out of the wheelchair space on the bus, and in many areas the buses are decidedly not wheelchair accessible. What is worrying about this is that with the proposed Personal Independence Payments under the Welfare Reform bill, it is assumed that because of accessibility laws there is no problem travelling as a disabled person now, and therefore disabled people do not need the extra money to help with travel that DLA provided. This is definitely not the case. Now that I receive DLA I have ordered a car through the Motability scheme and using that will get me to where I need to go reliably and on time, without the possibility of not being able to get my wheelchair into it one time out of ten, or suddenly having to wait for a different car. Clearly the world is not yet equal for disabled people and government ministers are deluded if they believe otherwise. Two weeks ago I went out to take some photos to illustrate a blog post on accessibility that I was working on. I took my photos, but then I took some video as well. Quite a lot of video. When I got home, the photos were useless but the video was quite interesting and so I changed my plans. Instead of a blog post with photos, I was going to create a short film. I needed a few more scenes to create my film, and so my wife and I went out a couple of days later and recorded the rest of what we thought we would need. That night I stayed up selecting scenes and stitching it all together in iMovie on an old iMac that I have. By the morning I had created several minutes of video that I was quite pleased with. It illustrated my point nicely, and had a nice flow to it. It was great, apart from one thing. It was appallingly bad picture quality. That was because it was all shot using a cheap digital stills camera which could only record video at 320×240, a quarter of the resolution of even low definition TV. In addition, the picture was horribly shaky and blurry. What could I do about it? I didn’t have a better camera. My phone could also record video, but at exactly the same low quality. All was not lost, however. I was ordering a new phone that very week. By a happy coincidence, the phone that I wanted happened to include a full high definition video camera which had received rave reviews. I ordered the phone and waited in high anticipation of its delivery. New phone in hand, we set out again to spend an afternoon filming. I had cleverly attached a car windscreen mounting kit to my powerchair and arranged it so that the phone camera had a clear shot from in that holder. We shot hours of video. I recorded pieces to camera many times over until it was right. It was repetitious and tedious. However, we eventually finished and returned home. After a brief rest (I was so worn out I couldn’t stay upright) I reviewed the footage that we had shot. It was AWFUL. Mounted on the powerchair, it was so shaky that watching it made me feel like my head was in a blender. Nevertheless, I grabbed what I could out of it and I made it into a rough approximation of the film that I wanted. Since then we have been out filming several more times, I have spent many many hours editing the results, and there have been several preview showings. I restarted the editing several times, learnt how to use Openshot in Linux and then Movie Maker in Windows, and eventually spent a mammoth 17 hour session producing the final edit and subsequently crippling myself for two days (and more to come) from the effort.